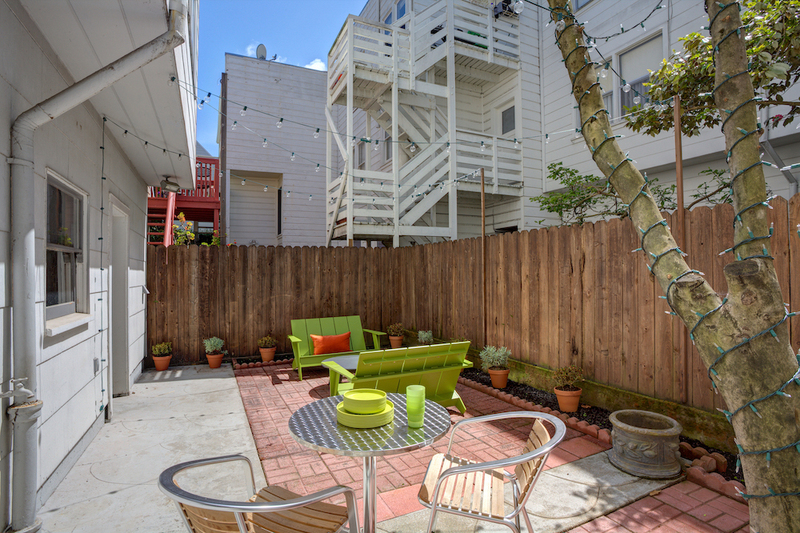 Perfectly situated on the Cow Hollow/Marina border, 61 Moulton St is the ideal place to call home. Featuring two bedrooms, one bath, approximately 1,015 sqft and one car parking. Details include polished oak hardwood floors throughout and incredible storage. The formal living room enjoys a wood-burning fireplace and overlooks the adjacent dining room that benefits from numerous built-ins, including a murphy bed. The timeless kitchen has been thoughtfully remodeled with white subway tiles and stainless steel appliances including a gas range and double ovens. At the rear of the home are the two south-facing bedrooms that are drenched in sunlight throughout the day and have ample closet space. The bathroom is intelligently designed with white tiles, a shower over tub, and a generous linen closet (plumbed for a shower). There is a shared patio at the rear of the property accented by tea lights. A large exclusive storage space in the garage includes washer/dryer hookups and incredible storage. 61 Moulton St is located within an intimate two-unit building perfectly positioned between the commercial corridors along Fillmore St, Chestnut St, and Union St.